The Royal Artillery entered World War 2 some 12 months after significant changes to its battery and regimental organisation and with a trend to increasing artillery centralisation in mobile warfare, not just ‘in periods of stabilisation’. Furthermore these new arrangements and their associated methods and procedures had not been fully tested and matured. The organisational changes in 1938 had decreased the number of regular batteries but most doubled their number of guns and the number of command posts. The number of officers on the gun position increased and the more experienced junior officers became the newly established troop commanders who were the observation officers. However, promotion had been slow since the 1920's so there was a substantial depth of experience available. In the Territorial Army (TA) it was more challenging because the ‘doubling’ of regiments meant the total number of batteries remained unchanged but each battery almost doubled in size. Furthermore the TA had been under-strength and so lacked trained soldiers and junior officers as the basis for expansion, although mobilised reservists doubtless brought experience. An added complication was the conversion of TA cavalry and infantry units to artillery. And in contrast to WW1, in the field the battery commander (BC) was not necessarily stationed at the gun position where he could supervise and instruct. The fire control procedures at the outbreak of war were given in the amended Artillery Training Vol 2 Gunnery 1934 (AT Vol 2), Range Tables Part 2 and a new series of pamphlets Directions for the Use of Artillery Instruments (DUAI). Two Military Training Pamphlets, MTP 5, 'Notes on the New Organization of Field and RHA Regiments and their Tactical Handling' and MTP 10, 'The Field Artillery Regiment', had been issued in 1938 for the new unit organisations. Troops were oriented by director (No 6 or 7) giving each gun an individual angle, it was the CPO’s responsibility to ensure all the directors in a battery were in common alignment and the fixation of each troop’s pivot gun was correct relative to the others. He also had to ensure orientation and fixation was as accurate to the map grid as possible but had no survey party. Ranged fire was normally ordered by a troop commander giving a range and switch from the Zero Line (ZL). No corrections were made for non-standard conditions, unless explicitly ordered, except that guns mostly had calibrating sights to correct the range for their individual muzzle velocity, angle of sight was usually taken as zero. Ranging was usually by a section of 2 guns with the observer ordering corrections as a switch from current line of fire and a new range. The GPO selected the charge and if the guns were not roughly in a straight line at right angles to the line of fire he ordered position corrections to roughly straighten their fall of shot at right angles to the line of fire using either a table prepared for the position or one of several ‘rules of thumb’. Crest clearance was considered when selecting a gun position and when shooting. If two or more troops of the battery were to fire then the ranging (control) troop’s pivot gun switch and range was converted pivot gun data for the other (link) troops using the DW plotter or rapporteur by Method A (at the battery CP) or B (at the link troop CPs). Targets located by map reference went to the battery CP, both CPO and GPOs produced map data using their artillery boards and cross-checked. The battery CP had an artillery board for each troop. See previous period for a description of the artillery board. Meteorological data was provided in meteor telegrams valid for 4 – 6 hours. Messages provided data for pressure at mean sea level, air temperature, wind speed and direction, in layers usually up to 50 seconds time of flight. Ranged targets could be registered, co-ordinates were produced in the battery CP and recorded on a Target Record Form AF B 2569. For predicted fire the switch, range and angle of sight had to be produced on two different instruments or by two different methods (eg Artillery Board and calculation using logarithms or slide rule). The usual way of this was that both battery and troop CPs did it using artillery boards, with the CPO comparing the results. The battery CP maintained target records and prepared meteorological corrections for the position using AF B 2551 Correction of the Moment and distributing graphed results and to GPOs. GPOs applied corrections if required, and always for predicted fire. Datum Points were also used and corrections graphed. Witness Points could also be used. The target numbering system used prefix letters for battery and regimental targets, meaning that all CPs at or below the indicated level had to have its details. Programme shoots (pre-arranged fireplans) used barrages and concentrations. Barrages plans were invariably issued as traces that were then mounted on batteries’ artillery boards. Barrages required each gun to have its own aimpoint on each line of the barrage. Concentrations were also on the trace but batteries engaged them using their normal distribution of fire. There were detailed procedures for preparing firing data for a barrage. Regimental targets could be engaged using several different methods including ‘rapporteur’ with the regimental trace, circulating ranged coordinates for the target, ranging each battery separately or using predicted fire. Calibration was according to peacetime policy. At the outbreak of war the regular and TA artillery survey companies were expanded to regiments and included troops with the specific task of providing survey to batteries. Expansion was probably helped by some University Officer Training Corps units having RA Survey Sections. There were no regimental survey parties in RHA or field regiments but they existed in medium and heavy regiments. Many detailed changes were made during the first half of the war, particularly to make some processes faster. However, apart from reflecting organisational changes and incremental improvements the overall fire control processes did not change. The minor changes started appearing before the end of 1939, and parts of AT Vol 2 started being superseded. The final two amendments (7 and 8) to AT Vol 2 were issued in 1941, the last being for airburst ranging. Weaknesses in the new procedures soon emerged. RA Training Memoranda No 1 (RATM No 1) issued in December 1939 reported problems. The regimental shooting trace was not successful for regimental concentrations so it was replaced by using 8 figure grid references and waiting for more experience to accumulate. At this time a regimental ZL was optional, but without one a regimental trace would have been effectively unworkable. It also seems that training was weak, too much reliance on CPOs was reported, with GPOs and their assistants not doing their tasks and the cross checks were inadequately performed. Supplement 1 - Lines of Fire: Command Post Organization: Fire Control and Programme Shoots to AT Vol 2 1934 was released at the end of January 1940. It replaced MTP 10 adding detail and making some changes. This Supplement 1 provided detailed amplification and updated programme shoot procedures for the new organisation. The main change was in the deployment procedure and it started by emphasising that all guns in a regiment had to have parallel ZLs and be on the same survey grid. A common ZL enabled concentration of regimental fire by link shooting, although RATM No 1 only weeks earlier had dropped it use! The initial orientation used a director compass, there was to be a standard regimental director with an accurate magnetic variation applied and all director compasses given variations in sympathy with it. The complication was the extent of visibility among battery and troop directors, full inter-visibility was highly desirable but not always achievable. In this case intermediate directors had to be used. Stage 1 – get the ZLs as accurate as possible to the map, and fix and orient the troops in a battery in accurate relation to each other and the ZL. Stage 1 produced a regimental shooting trace after CPOs had exchanged their battery traces, which enabled the fire of the regimented to be concentrated. Stage 2 – checking parallelism to ensure that all guns in a battery were parallel. Stage 3 – ensure the ZL is as accurate as possible and that pivot guns’ fixes are accurate to the grid. Stage 4 – ensure the batteries’ pivot guns are fixed to the same grid, preferably the map grid. To do this an ad hoc regimental survey party was formed by taking a pair of surveyors from each battery. The campaign in France in 1940 showed that some procedures were still unsatisfactory – “As a result of the recent fighting in France and Belgium, it is generally agreed that the existing procedure for lines of fire and fire control is too complicated and difficult to learn and too slow in operation to give the result required”. This quote was the opening Preface to ‘New Procedure for Lines of Fire, Fixation and Fire Control’ issued in July 1940. While it stated that “the organisation of an artillery regiment is still under consideration” it was written for batteries of two troops and a regimental survey party. Early the following year field regiments started reorganising into three batteries, each with two troops, and a regimental survey party. The latter meant that the surveyors in the battery CP became ‘CPO Assistants’. The new procedure required GPOs to lay out their troop position, align their guns by director and ‘map spot’ their pivot gun. The CPO checked these, then ensured ZLs were parallel, that the relative fixation of was troops correct and that each troop had the other’s survey data. Regimental survey subsequently delivered more accurate orientation and fixation to each troop and the CPs applied ‘change of grid’ procedures. Orientation to the troop director was the survey priority, fix could be to either the director or pivot gun, with the GPO taking it from director to pivot gun if necessary. In due course the regimental orientation and fix was updated by the corps survey regiment and change grid procedures again carried out by battery and troop CPs If orientation changed then directors changed the angles to their reference points and guns the angles to the Gun Aiming Points (GAP). Link shooting was simplified by introducing a new fan protractor that covered an arc 30° either side of the ZL out to 16,000 yards to replace the DW plotter, however, the rapporteur method was retained. This was despite RATM No 1 stating that the DW plotter was issued, successful, and preferred to the rapporteur! The Protractor, Fan, No 4, usually on Kodatrace as AF B 2579, was at 1:25,000 scale and also called the Tetley Fan. The fan was about 20 inches long and DUAI No 2 Artillery Boards was amended for it. The fan provided a simple method of measuring on an artillery board the switch and range for a link troop to the ranged aimpoint of the control troop. At much the same time a new artillery board cover, B 2593, at 1:50,000 scale was introduced for long range guns. with the link troop's position and ZL and read the link troop switch and range to the ranged target. During shooting the control troop (doing the ranging) converted their data to that of the link troop and passed it to the link troop when fire for effect was ordered. It was not called ‘Method C’ although it was the third permutation of possible methods! The basic technique was to plot the control troop’s pivot gun switch and range then measure the link troop’s switch and range to that point. The standard process for troops shooting with ranging was for the observer to order an initial switch from ZL and the range, which was applied directly to the guns, subsequent corrections (switches and or a new range) altered these. Against impromptu targets involving a battery or less observers usually ordered the range and switch from the zero line, and ordered their ranging corrections in the same way. Basically all the GPO did was select the charge. Corrections for non-standard conditions were not applied unless specifically ordered by the observer and angle of sight was not used unless it was ‘significant’. The GPO ordered concentration or position corrections if necessary. When angle of sight was used it was usually applied as the same for both troops. There were several methods for calculating angle of sight, including an approximation formula, slide rule, tables and an Angle of Sight Graph AF B 2611. However, calibrating sights meant that the ordered range was automatically corrected by each gun for its muzzle velocity variation from standard. The drift correction could also be set directly onto the sights. Of course when a observer ordered a target location as a map reference the CPO had to report the BT range to him. The battery CP was responsible for calculating correction of the moment from the meteor message for troop CPs to apply, barrages, programme and predicted shoots, recording targets and deducing co-ordinates of recorded targets. The CPO had an artillery board set up for each of his troops. However, the new procedures also cautioned that regimental concentrations should not be attempted until regimental survey was completed. RATM No 2 (July 1940) echoed the changes in deployment procedures in New Procedure for Lines of Fire, Fixation and Fire Control. Clearly the number of directors was causing confusion at night because it stated that differently coloured lights were essential on battery and troop directors and detailed the colours to be used. It also stated that all GPOs should be able to act as CPO and that battery CPs should be divided into fire control and tactical offices. It highlighted that while the principles of the new procedures were being followed, there was little uniformity in their details. However, it also reported that predicted fire was mostly effective, that the angle of sight graph was a great improvement, and that the rapporteur would bring fire of linked troops into same place as control troop. Less positively it noted that regiments needed at least 2 hours from receiving barrage traces to be ready to fire a barrage. This led to a new Supplement 2 to AT Vol 2 in 1940 giving new procedures for programme shoots using BE Smoke and Gas shells and changes in target numbering. It made minor changes to the procedures for using Datum Points and Witness Points, and recognised that both were ranging points. As such they should be in or near a target, visible on the ground and accurately located on a map. However, they could be accurately fixed in space in the case of airburst ranging when a target location was accurately known but could not easily seen. AT Vol 2 only considered ground burst Datum Points and airburst ranging of a target. It’s hard to avoid the conclusion that lessons from WW1 were being re-learned. Ranging points could be used when accurate fire was wanted on a target without ranging the target itself. Guns were ranged by observation or cross-observation by battery or Flash Spotting OPs, or from air in cooperation with RAF, Sound Ranging could also be used. A ranging point in the air was by cross-observation, normally by the Flash Spotting battery. Range corrections were applied proportionally, based on time of flight if the difference in range to target and ranging point was greater than 200 yards, the line correction was unaltered. In the period late 1940-42 various changes were made to fire control methods and procedures in CPs. The general purpose of these seems to have been simplifying to make them quicker. This was particularly the case for programme shoots and barrages, although for these the changes were mainly in planning that resulted in simpler CP work by greater use of standard templates. 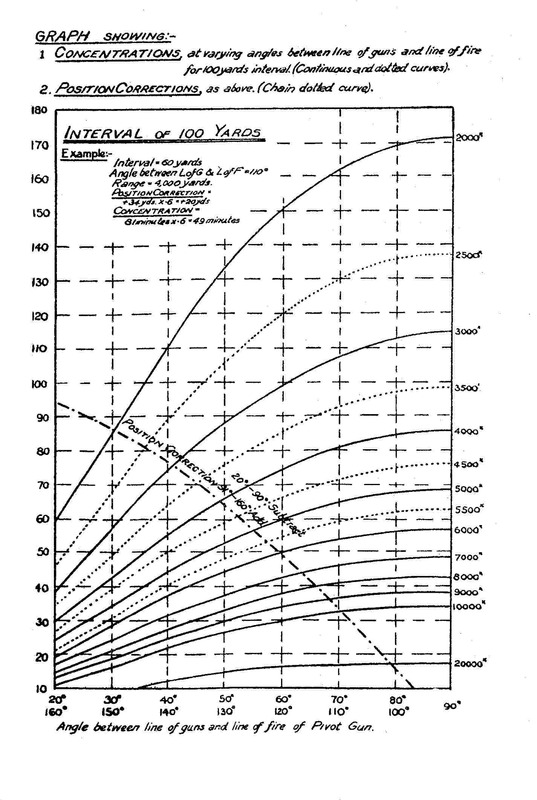 A new edition of Range Tables Part 2 (RT Pt 2) was issued in 1940 replacing the 1930 edition. New material included data for concentration or distribution on a target (eg barrage), from pivot gun according to interval between guns. More tabulated data for concentrations, a graph for range and angle of sight to aircraft, more survey forms and additional slide rule settings. At some time around 1940-41, and possibly earlier, a new instrument was conceived: Rule, Correction B.C. It appears that there was to be one for each type of gun, that for 25-pdr was No 3, for 5.5-inch No 5. Its purpose was to rapidly determine correction of the moment. It was a double sided slide rule made mainly from aluminium, bakerlite and celluloid and almost 2 feet long. One side was the deflection side that enabled deflections for wind for each charge to be found, it had several dials. The other, range correction, side used a set of 6 slides each slide having data for a different charge on each side. These slides were in effect nomograms. Slides were set to the current non-standard conditions then by starting with the map range at the top a line could be followed across the slides to a predicted range at the bottom. However, it appears that these instruments did not enter service, probably because Range Tables underwent quite frequent amendment or replacement and while printing was simple producing instruments was more complicated and costly. At the beginning of 1941 the ‘rapporteur’ method of converting control troop to link troop data, using tracing paper, was modified and renamed the ‘window’ method. The new method meant it could be used on a normally set-up artillery board, the old method required the pivot at an intersection of grid lines with the ZL along a vertical grid line, which made it very difficult to plot map references. By this time the notion of using a regimental window trace seems to have been dropped as a means of concentrating the fire of a regiment' s batteries and with it the need for a regimental Zero Line. was placed on the artillery board so that the control troop was on the ranged target, range and switch were then measured to the link troop. The next important change was a better method for concentration guns within a battery and their position corrections. The 1940 version of RT Pt 2 had introduced a graphical method for calculating these. 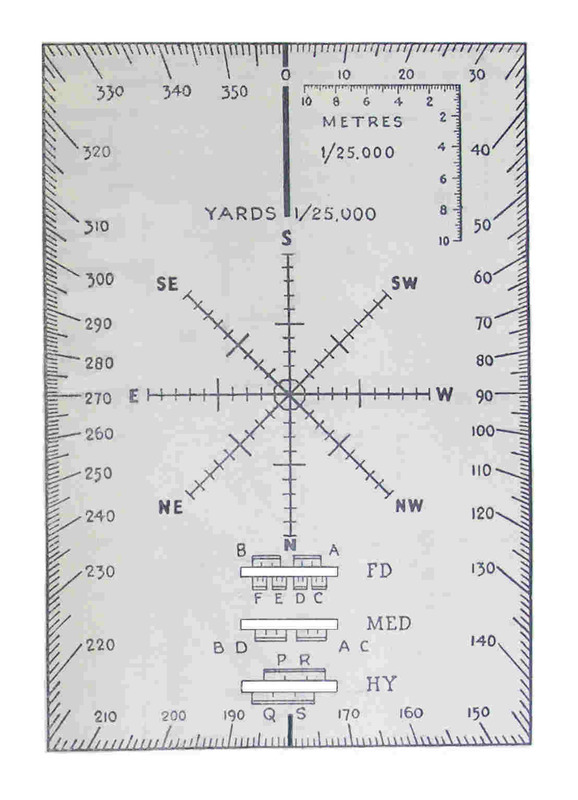 This graph became an official form, AF B 2596 ‘Concentration and Position Correction Chart’ with instructions in B 2596A, it was known as the Sands Graph, see Figure 4 below. There were refinements to the procedures given in Supplement 2 including a simplified method of allotting tasks and points of origin to guns for predicted smoke. This reduced the number of individual gun programmes and kept a gun in reserve per troop. There was also a change to method of calculating non-rigidity, and to the procedure for ranging with Sound Ranging. Limits were placed on the interpolation of aim points in barrage. When the line of fire was oblique measurements had to be made every 300 yards with interpolation in between. Also in 1941 the standard gun layout changed. The guns in a troop normally deployed about 20 - 30 yards apart and this had been in a straight line. This was changed to a curved layout to enable better anti-tank defence against flank attacks, obviously a lesson from the desert. It changed again in 1942. Method of laying out the Line – Director or compass from flank or distant aiming point with correction for parallelism, or director individual angles. Concentration and position corrections – AT Vol 2 Sects 36, 37, 53; RATM No 4; AF B 2596A. Link shooting and use of fan and window – RATM No 5; DUAI 2 Chap 4; ‘New Procedure for Lines of Fire, Fixation and Fire Control, July 1940’. Calculation of Correction of the moment from meteor – AT Vol 2 Sects 88-91; AT Vol 2 Supplement 1; RATM No 5. Deduction of co-ordinates by shooting and adjusting angle of sight – AT Vol 2 Sects 74-82, Appx 3; RT Pt 2 pg 31; RATM No 5; DUAI 3 Slide Rule. Barrages and programme shoots including predicted smoke screens - AT Vol 2 Supplement 2; RATM No 3. Recording and numbering of targets and correction of records on change of grid – AT Vol 2 Supplement 2; RATM No 4. Procedure for quick barrage – RATM Nos 4 and 5. Crest clearance – AT Vol 2 Sects 28, 29; RT Pt 2 pg 16; Range Tables Pt 1 Crest Clearance Tables. The 1939 method for measuring charge temperature, the thermometer in its case secured to the outside of cartridge case out of direct sun. Temperature taken every 6 hours, and use a running average of the last 24 hours. This was clearly a pervasive problem because RATM No 9 repeated it in late 1943. Quick actions - assume guns are parallel to the ordered ZL, and make a quick calculation for displacement of the link troop. Graphical method for quick barrage, an alternative to the method given in RATM No 4. On the troop lane measure Nos 1 and 4 guns, interpolate for Nos 2 and 3. Plot the opening line with position and concentration corrections applied, then using a template measure range and switch to other lines. It also identified an issue that had been previously ignored, adjusting the angle of sight after ranging. This problem arose when a registered target’s coordinates were deduced after ranging. The problem was splitting a Quadrant Elevation (QE) into its Angle of Sight and Tangent Elevation (TE) components with the complication of non-rigidity. The solution involved the Angle of Sight Graph AF B 2611 and plotting the different heights from map contours in the target area to give a terrain profile. RATM No 6 of September 1942 was the last that made significant changes to gunnery procedures, and in 1942 a new series of AT Vol 3 Field Gunnery training pamphlets started to appear and consolidated the various changes. However, RATM No 6 introduced a new procedure for quick barrages and the new procedures for regimental and higher concentrations against impromptu targets. The last, which in practice replaced the various techniques given in AT Vol 2 1934, was most important. The revised quick barrage procedures were not just technical. They emphasised that the time taken depended on good organisation and intelligent anticipation. From issuing orders to the guns being ready involved the passage of fire plan orders, ranging, deduction of map references of ranged targets, passing these to other CPOs, preparing gun programmes and laying the guns. Fire Plan orders were sent to Regimental Headquarters (RHQ) by different communications to those used for ranging, RHQ immediately distributed key information to all CPOs (rates, line numbers and spacing, battery lanes, timings and Z-hour). Rough map spots of ranging points were also sent to CPOs immediately they were identified so that they could deduce position and concentration corrections for gun programmes. A quick barrage table was also used by CPOs. This was based on the mean for the barrage. It gave the angle between the barrage axis and the mean line of fire for each troops’ pivot gun layed to lane centre, and the actual lift distance per 100 yards and actual line alteration. In theory the 'window' method (Fig 2 above) should have been easily applicable to concentrating the fire of a regiment's six troops if they used the same ZL, although multi-regiment engagements would have been another matter. The apparent failure of similar methods in France clearly required a solution. A new procedure was developed by Brig HJ Parham, CRA of 38 Inf Div and after trials was also promulgated in RATM No 6. It enabled an observer to control concentrations of any number of regiments. Its heart was communication procedures across several voice wireless networks (at regiments, division and corps level depending on what the observer ordered. The great advantage of the procedure was speed. Each battery produced its own firing data as the shoot progressed and was therefore ready to fire, this avoided the delays of centrally producing data for all batteries in a 'control' CP. However, it only required minimal changes to technical fire control procedures because almost all the necessary methods and instruments were already available, even if rarely used. Initial data was produced by each CPO in the normal way, with a target located by map reference or target number. If the observer decided not to open with fire for effect then ranging guns from one battery ranged the target. The ranging battery was normally the one that reported ready first, which usually meant it was from the observer's own regiment because there were fewer communications links (unless the observer was on a formation not regiment wireless net) but also because the observer was more likely to know their lines of fire on the ground. The other batteries all calculated the ranging corrections ordered until the observer completed ranging. He then ordered a Scale of fire to all batteries. The practice of selecting the first battery ready for ranging developed healthy competition between batteries and encouraged fast shooting. The technical issue was that ordering a common correction to all batteries had to be distances, the more usual range and switch would not work because batteries had different ZLs and ranges. Normally every battery applied the ordered correction, with the order prefixed by 'All'. New terms were introduced - Left or Right and or Add or Drop and a distance in yards, usually to the nearest 100. Each battery and troop applied these corrections to their own firing data. The Add or Drop correction could be applied directly to the range arm on the Artillery Board with the Left or Right easily plotted or calculated by subtension. This was satisfactory as long as the lines of fire of the batteries were all within about 30° of each other, ie an angle of about 30° at the target to the two flanking batteries. However, if the batteries were further apart and the corrections more than 500 yards then the fall of shot would be too dispersed and another method had to be used. This was a compass bearing and distance from the fall of shot to the target. Obviously the observer usually had to estimate this and the method was to give a cardinal point (N, E, SW, etc) and a distance in hundreds of yards to hit the target. 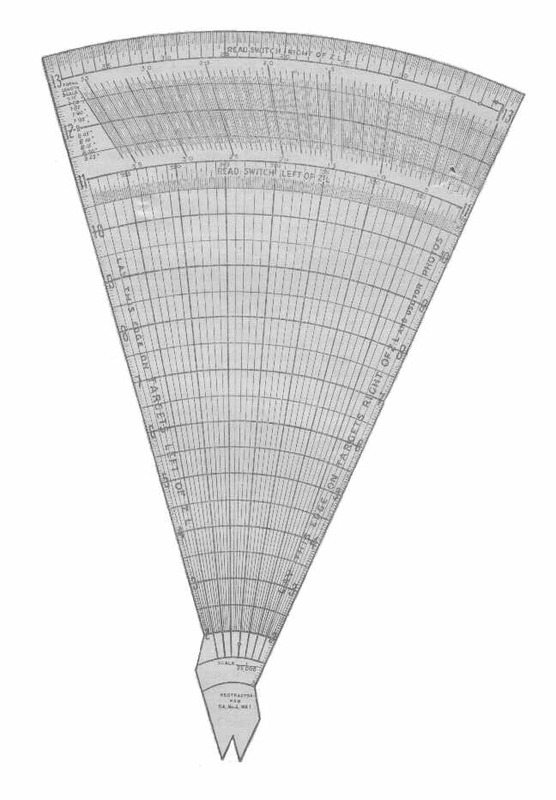 This was facilitated by a template for plotting corrections on an Artillery Board, these were simple and could be made by units using celluloid. Subsequently an issued protractor was produced, which also provided a template for the standard Stonk, see below. with the map grid then range and switch measured to the ordered correction using the board's range arm. The Stonk templates (marked FD, MED, HY) give regimental troop lanes for field and medium batteries and lanes for heavy batteries. With the prospect of the fighting moving away from open desert, and new Military Training Pamphlets emphasising camouflage and concealment, gun positions were set to become more complicated. The camouflage doctrine included fitting gun positions to the terrain, although this was hardly new because it had been used in WW1 for heavy guns. RATM No 6 included the reminder that with staggered gun positions, position corrections must be used, that Nos 1 and 3 on each gun must be practised, and that GPOs must always apply position corrections except for Gunfire (ie moving) targets. Other reminders included the need of GPOs to make mental checks for gross errors and the necessity to sort ammunition by propellant nature and lot. GPO responsible for his troop’s guns being parallel in the ZL and ready as soon as possible. CPO responsible for troop pivot guns being parallel and for providing common orientation to troop directors as soon as possible. Regimental Survey Officer (RSO) responsible for regimental orientation to a director or gun in each battery. GPO map spots his pivot gun. CPO ensures map references of troop pivot guns in sympathy, agrees map reference of one then bearing and distance to the other using compass and pacing or estimate, then by traverse soon as possible. RSO fixes a point in each battery area, CPO carries fix from this point to pivot guns, should have completed measurement from this point by time RSO provides fix. Preparation of concentration and position correction tables or B2596 (Sands Graph), for both troops, using data provided by the GPOs. Preparing Correction of the Moment graphs. Keeping target records and deducing coordinates, including adjusting them for angle of sight. Produce gun programmes for barrages, predicted shoots, etc. Pivot gun on the alternate position. Preparations for shoots with air observation. In addition preparations were made for an alternate position. In the CPs this meant windows or No 4 fan were prepared (whichever used), ZL marked on artillery boards and labeled, and a separate target record form prepared. The troop CPs basically comprised the GPO, a GPO assistant and signallers. The troop leader (another officer) and troop sergeant major (WO 3) were available to relieve the GPO and to act as section commanders on the gun line. The revised role of Section Commander had been introduced 1942. It could be performed by any officer, WO or NCO. It meant supervising the two guns of a section to ensure that they were always parallel, that routine maintenance tasks were completed, assisting with passing orders from GPO to guns and generally monitoring to ensure that the guns were using the correct data. It explicitly excluded routinely checking sights and laying. Individual angle method, troop director more than 100 yards from the nearest gun, if all guns were not visible then intermediate director to be used. AP method, quicker than Individual Angle method, to be used when suitable AP available – distant and visible to all guns. Director to be close to pivot gun at 0 deg in the ZL, record angle to AP (or grid bearing to AP less ZL), AP indicated to Numbers 1 with AP angle, guns layed, and corrections for parallelism applied. For Quick Actions – director, GPO takes bearing from pivot gun to director, subtracts ZL, pivot gun uses director as AP on this angle. Director lays on pivot gun then angles to other guns. Link troop GPO establishes displacement and converts control troop’s orders. After CPO’s check of ZLs and pivot guns, GPOs plot both pivot guns on their artillery boards, plot ZLs or make a window for both troops. When CPO puts both troops on battery grid, adjust windows and artillery boards. Concentrations and position corrections were tabulated as per RT Pt 2 using AF B 2596 (Sands Graph). Crest Clearance calculations, range and angle of sight to crests, tables in gun Range Tables, GPO got orders from CPO or BC for the minimum range to be achieved (called ‘Line To Shoot Down To’ (LTSDT)). DF(SOS) - written details to each gun, amended as meteor changes, guns layed on it when not otherwise engaged. Target records – GPO sent uncorrected, ie ‘as fired’, data to CPO, who corrected it and record to RHQ. Troop target numbers used troop letter as prefix. Batteries used battery letter prefix P, Q, R or S by seniority. M, U, Y and V were used for regiment, division, group and corps opportunity targets. Other prefix letters were HF, DF, ML (misc) and HB. Target numbers BC – 101, 103, 105, etc; CPO 102, 104, 106, etc; OPs 1, 2, 3, etc; CO 1, 3, 5, etc; Adjutant 2, 4, 6, etc. Target Record Form B 2569 (1943) allowed progressive change of grid for a troop, target numbers, co-ordinates and grid type, ammo, pivot gun switch, angle of sight, range, how obtained and corrected or uncorrected, gun corrections. Change of Grid – GPO changed orientation, CPO amended target records. Angle of Sight Graph AF B 2611 (oversize, folded in back), at 1:2,500 scale, with range in yards and metres to 12,000 yards, and height differences in feet and metres to 600 feet. Sands Graph AF B 2596 for concentrations (angular convergence of fire onto a point) and position corrections (range convergence onto a point or to produce fire roughly on a line at right angles to the line of fire) with range to 20,000 yards. Tabulated data for Concentrations in minutes (range on vertical axis, angle line of fire and line of guns on horizontal axis) and position correction in yards (horizontal axis as per concentrations, vertical axis interval in yards) was also provided. Example calculations for airburst ranging for correction of the moment using a special graph for non-rigidity instead of the normal ‘Non rigidity correction graph’ or ‘Table of Corrections’ given in range tables. Results were to be plotted on graph and could be circulated. Battery-target range, longest at the bottom, on the right vertical axis, convergence angle in minutes, position correction in yards both for 100 yard interval on left, angle between line of guns and line of fire on horizontal axis. The 100 yard convergence angle was read from the relevant range curve and the position correction distance from the single curve, and converted for each gun's distance from the pivot gun. In August 1944 RATM No 12 introduced a new method of calculating Correction of the Moment, which was also published in a new pamphlet AT Vol 3, Pam 4 Predicted Fire. The purpose was to simplify calculations and enable rapid production of correction of the moment in the form required for correction of the moment graphs. This was done by adding special correction of the moment tables (Taylor Tables) as a supplement to the Range Tables Part 1 for each type of gun. These tables gave all the data required for each charge for calculations of correction of the moment for ranges corresponding to time of flight in tens of seconds. The table was described as a ready-reckoner, the actual corrections were tabulated for “any value of barometer, charge temperature, air temperature, or wind likely to be met”. It introduced a revised form B 2551A Correction of the Moment for use with the new tables. This form had 4 columns (meteor message Times of Flight appropriate to the charge), each with 3 sub-columns for ZL, 30° Left and Right. In the tables barometric data was given for every 0.2 inch, air and charge temperature every 2°, and wind every 2 ft/sec. Charge temperature tables were for different propellant types and multipliers for others. There was a projectile weight correction in yards per Time of Flight column. Using the Form B 2551A, meteor message and the tables the CPO produced line and range corrections that were plotted on graph paper and distributed to GPOs. This graph had range on its horizontal axis, range corrections were plotted in the top half of the graph (yards being the vertical axis) and corrections for the 3 different line directions covering a 60° arc in the bottom half (minutes the vertical axis). For use against a particular target the data was read from the graph against range. The policy for applying correction of the moment remained unchanged, always in programme shoots and whenever ‘Apply correction of the moment’ was ordered by an observer. However, ‘Apply correction of the moment’ could be ordered when there was no meteor telegram, datum or airburst ranging data available. In this case RHQ was required to provide and circulate estimated corrections. A method of estimating was published in an amendment to RT Pt 2 1943. Revised crest clearance procedures were also given. The No 1 of each gun was responsible for any crest immediately to their front. The GPO was responsible for any crest visible from his troop position and the troop commander responsible for any crest not visible from the battery position. The QE (or Angle of Departure) set on a gun had be greater than QE (or Angle of Departure) to hit any of the crests plus a safety allowance. This safety allowance was half the 100% zone at the range to the crest. The problem could also be solved using crest clearance tables for charge given in Range Tables for each gun. The procedure required GPOs to make a table for a series of angles of sight and the minimum safe range at each charge for each. Quick barrage table: vertical axis angle between line of fire and axis of advance, then column for range increase per 100 yards lift, then columns of line alteration per 100 yd lift for mean ranges 2,0000 – 10,000 yards. Converting a US metro message into a UK meteor telegram. Droplet drift from Base Ejection chemical shell. RATM No 11 April 1944 introduced some standardisation to defensive fire and attack fireplans, essentially matters of artillery staff duties. However, it also standardised linear concentrations or ‘Stonks’ by making them a standard length (525 yards) at right angles to an ordered axis. The distribution of fire along the linear was standard but varied with the type of regiment (field, medium or heavy). Troop CPs used a template (see Figure 3 above) and measured data from their pivot guns to the troop guns’ aimpoints then applied position corrections and concentrations, angles of sight, and correction of the moment if ordered. Each then reported their pivot gun’s data to the battery CP, the normal procedure if a target involved more than one troop. The CPO assistants each plotted their troop pivot gun data then using window plotted the other troop, they then compared their data, then compared it to the data reported by each troop CP. The need for upper register fire with 25-pdr emerged during mid 1943 in Italy and Burma because of their mountainous terrain. Ad hoc procedures were adopted including use of 25-pdr intermediate increments. These increments having been previously introduced for anti-tank fire and added to charge super. To physically achieve the elevation the guns had to have either wheels on mounds or trails in pits, AT Vol 3 Pam 15 provided designs for the latter. When guns where positioned for upper register then their dial sight mounts could no longer be made vertical so cranked adaptors were introduced. There was no Range Table data. Standard calibrating sights could not cover the upper register elevations for range. Charge overlap was poor, intermediate increments were introduced for 25-pdr. Times of flight were longer and greater than those provided in a standard meteor telegram. In April 1944 the use of upper register (ie elevations above 45°) fire was fully recognised by RATM No 11. In September 1944 Supplementary Range Tables were issued for 25-pdr intermediate charges. At the same time a new AT Vol 3 Pamphlet 15 Upper Register Firing was issued. Then RATM No 13, December 1944, appeared. It gave simple methods for using gun rules with 25-pdr intermediate increments until new gun rules issued. Eg for Charge 2 + increment use charge 2 and order false range of true range minus 1/5. This never gave results that were wrong by more than 75 yards. Firing Tables were constructed differently to Range Tables, angles were given in mils not degrees and minutes, non-standard conditions used air density instead of barometric pressure and meteor data (in metro messages) was based on met lines not time of flight. The main problems were 105-mm Howitzer M7 Priest and 155-mm M1 Gun that were introduced from late 1942 onwards. However, neither was used in large quantities, perhaps about 12 - 15 regiments of the former at its peak and some 20 batteries of the second. To this can be added a few batteries of 75-mm How and from late 1944 a handful or so of 8-inch Guns and 240-mm Howitzers. More detail about US metro message differences is here. The Canadians developed Range Tables for Priest by converting from a 105-mm M2A1 Firing Table which were adopted by UK, and UK produced them for 75-mm and 155-mm Gun. UK had also produced RTs for the old generation of M1917 155-mm Howitzers. These tables gave elevations in both mils and degrees, and drift in mils, and the appendices included mils - degrees conversion tables. There was also a programme of production for gun rules and fuze indicators and in late 1944 dial sights and adaptors for US sight mounts were issued. Gun rules were used by each gun, they converted range into TE taking account of the gun’s individual MV for each charge. It’s unclear if mils bearing arcs were produced for artillery boards, but mils compasses or directors don’t seem to been used. In the meantime CPs used Firing Tables, converted meteor to metro messages and converted between mils and degrees. They also had to calculate and order elevations for each gun. All this inevitably reduced the speed of response and increased the opportunity for mistakes.